Leopards hang their head in shame at being beaten in a wrestling tournament by goats. 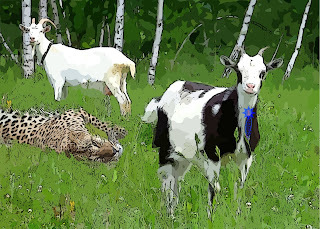 The leopard’s ancestor said, "I did not know that a goat could beat me!" The Goats tournament African Folklore story tells the tale of the Leopard's Tribe embarrassing defeat to goat in the great animal wrestling match. The Tribe of Goats sent a message to the Tribe of Leopards, saying, "Let us have a wrestling match, to see which is the stronger.” King Leopard took counsel with the wisest of the tribe, "This Tribe of Goats! I do not see that they have any strength. Let us agree to the contest; for, they cannot win! " Therefore, the Goat and the Leopard Tribe gathered meeting in the street of a nearby village, to engage in the drumming and dancing and singing which usually precedes such contests. For the wrestling, they joined in thirty pairs, one from each tribe. The first pair wrestled: and the representative of the Leopards was beaten and thrown to the ground. Another pair joined: and again the Leopard champion was beaten. A third pair joined and wrestled, fighting hard but once again the Leopard was beaten by Goat. There was, during all this time, drumming, dancing and taunting by Goats and Leopards. Then, in the fourth match, Leopard won! Another pair fought: and Leopard overcame a second time. The sixth pair joined; and Leopard said, "Today we wrestle to settle that doubt as to which of us is the stronger!" Pair after pair wrestled until all of the thirty arranged pairs had contested. Of these, the Leopard tribe were victors ten times; and the Goat Tribe twenty times. Then the Leopard tribe said, "We are ashamed that the gossip should go out among all the animals that we beat Goat ten times, and Goat beat us twenty times. King Leopard said "We will not stay any longer here, with their and our towns near together for they knew that their Leopard tribe would always be angry when they should see a company of Goats passing, remembering how often we were beaten." Therefore, the Leopard tribe moved away into the forest distant from their hated rivals.